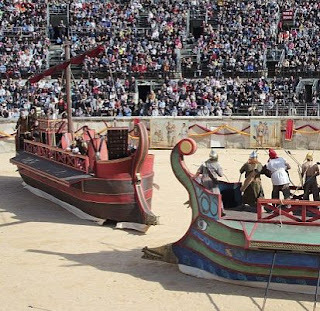 A jolly re-enactment of a Roman games at Nimes. In a Roman amphitheatre with thousands of spectators and hundreds of costumed re-enactors. 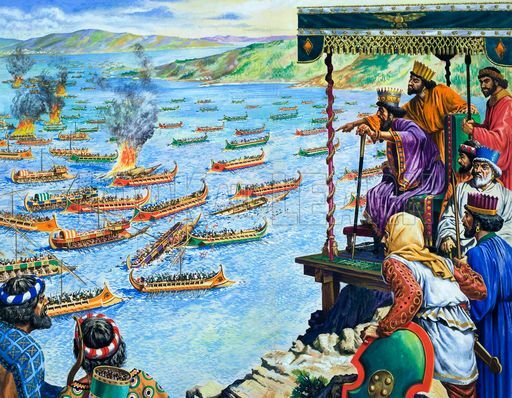 Cleopatra and the Battle of Actium featured! The ships look like fun - I wonder how they were propelled ? Trieres included a maybe unexpected member of the crew. He was the auletes /αυλήτης or trieraules. His purpose was to give the oarsmen the beat for their rowing rhythm. The instrument he played was the ancient two-pipe flute called the aulos. 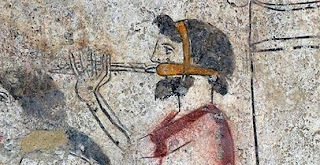 The auletes was used by the rowing master - the keleustes - to maintain a steady beat over time. In larger or later vessels a drum may have been used by an individual entitled the portisculus/pausarius - the hammer-wielder or beat-giver. The auletes used a strap-brace to keep the instrument in place. When Olympias was on trials a tannoy system was implemented to allow direct and simultaneous communication with the whole crew. Getting 170 men to work in unison is no easy matter..
On each trial usually took some days before the oarsmen rowed properly in unison and once this basic standard was reached the necessity for communication was lessened. One must remember that the ancient crews grew up rowing and had the technique instilled in them. They needed occasional prompting not an ear-lashing to get them to work together and at the right rhythm. This year the Edinburgh Lyceum, in conjunction with the Actors Touring Company have a production of Aeschylus' 'The Suppliants' or 'Suppliant Women' directed by Ramin Gray. Passing over the rather tatty production values and the attempts to make modern political parallels, one aspect of the production is worthy of note. The music includes an aulos. The auletes for the production is Barnaby Brown and he spent a year learning the instrument. He was , of course an accomplished flautist already. The Chorus of the Greek theatre sang and danced to the aulos, and so too did the oarsmen work to it. Aeschylus, the renowned Athenian playwright, was not one of your modern Ivory Tower scribblers. In ancient Athens the Middle Class put their hoplons on the line for the city in order to maintain both their state and their status. Aeschylus definitely fought at Marathon and he may have fought at Salamis too - he would certainly have been present there. His brother lost a hand in the fighting. Listening to the aulos brought back to life by Barnaby Brown and others is to listen to the sound created by the auletes in the ships at Salamis. Not only that, but the all the galleys plying the seas of the Athenian Empire, the Black Sea and all over the Mediterranean. 170 sweaty, toiling men under the canopy of a trieres would share the drone and reedy wail of the aulos. They must have keenly eyed the auletes at the start of the voyage and hoped the new face knew his stuff - chaos and crumpled eardrums could otherwise ensue. There are some excellent videos of aulos playing on YOUTUBE. Shut your eyes and imagine you are resting on your oar and just listening to the auletes for a minute. No doubt he could also whistle up a festive tune for the evening to relax by. VID 2 - Barnaby Brown at the breathtaking temples of Pæstum. VID 3 - If you survived the first two, this is a reward. Not such an accurate copy but a great musician playing a nice melody. Anton Platonov gives it gas. See his other aulos videos too. There is also the triple pipe from Sardinia, still played today, but I am subjected to this regularly on CD by my girlfriend. It is not 50% better than the aulos. I would rather face the Persians than a bunch of pipe-wielding Sardinian shepherds!